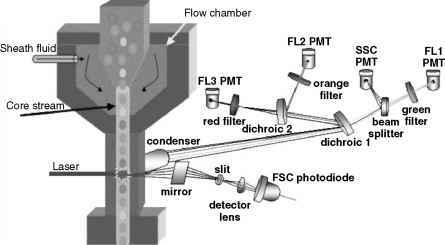 A flow cytometer consists of a light source, which in all modern flow cytome-ters is a laser, and illumination optics to focus the laser beam on to a flowing biological cell or a polystyrene microsphere, which is fluorescently labeled. The scattered laser light and the fluorescence response are separated and focused onto photodetectors. A special electronics processes the optical response and controls a sorter if it is provided. These components of a flow cytometer are described in detail here. Light Source. A flow cytometer may use a single excitation wavelength or a number of excitation wavelengths from different laser sources. The laser beams can be coaxial or separated so that one or more interrogation point occurs. 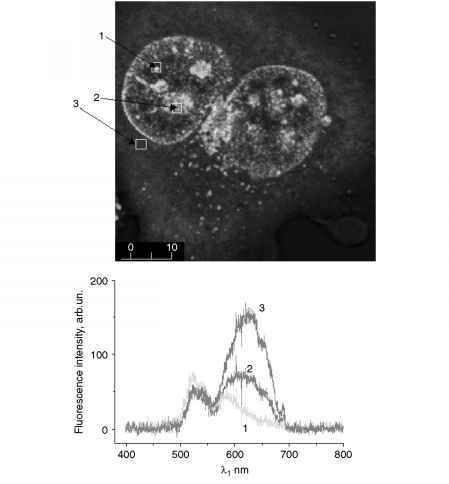 The critical requirements for a laser in flow cytometry are power stability, high-quality beam characteristics, and low-level high-frequency noise. In older versions of flow cytometers, the blue-green wavelength region was covered by an argon ion laser (Chapter 5), which provides excitation wavelengths of UV (350-365 nm) as well as 488nm and 514.5nm. The red region is covered by a helium neon laser (632nm). The current trend, however, is to replace these bulky and inefficient gas lasers by compact solid-state lasers. As discussed in Chapter 5, diode pumped solid-state lasers are available at 488 nm and 532nm. The red (635-670 nm) and blue (~405nm) regions are covered by a number of diode lasers. Another new prospect is the use of near IR lasers (700-800nm) to excite IR dyes, whereby the problem due to autofluorescence interference is considerably reduced. Flow Cell. The flow cell is designed to hydrodynamically focus the sample stream. A typical flow cell design is shown in Figure 11.1. A cell suspension is introduced through a core inlet which has an inner diameter of 20 mm and is surrounded by a larger (~200 mm) stream of flowing saline (sheath liquid). Therefore, in this arrangement, a core stream of the cell suspension is injected into the center of the sheath stream. 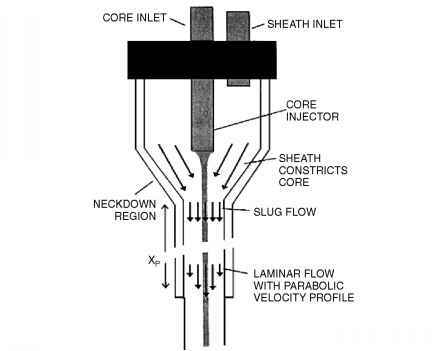 During the flow, the sheath fluid produces hydrodynamic focusing of coaxial flow of the core fluid, whereby the two streams maintain their relative positions and do not mix significantly and move at the velocity of the sheath fluid. The hydrodynamic focusing produces the flow of cells in a single file (one cell at a time). The core and sheath streams are driven by syringe pumps or by sources of pressure that deliver a known volume of sample per unit time with minimum pulsation. From the sample flow rate, one can easily derive the cell count per unit volume. The rate of cell flow is significantly influenced by the sheath flow rate, the differential pressure (the pressure difference between the sheath and core), and their concentration in the sample tube. Generally, the sheath pressure, which determines the velocity of the fluid passing the laser beam, is held constant. As the differential pressure is reduced, a stronger hydrodynamic focusing of the core produces increased resolution because the core diameter becomes smaller. On the other hand, if the differential pressure is increased, the core diameter becomes larger and more cells are "pushed" into the system. If the sheath pressure is decreased, the velocity is decreased so that the time spent by a cell in the illuminating beam is increased. This may be useful if the amount of light collected from cells is a limiting factor. To maintain good stability, the core stream requires a velocity of at least one meter per second. At this speed, a cell would traverse its own diameter (<20 mm) in a few microseconds. An important consideration of the core diameter is also the width of the illuminating beam. The core diameter needs to be considerably less than the beam diameter to keep the cells at the center of the light beam in order to ensure uniform illumination. To accomplish this, beam-shaping optics are used so the laser beam is not circular. Illumination Optics. Optical elements between the laser and the sample are referred to as illumination optics and are used to shape and focus the laser beam. Except for certain diode lasers, most laser sources produce circular beams that can even be a true Gaussian intensity distribution (see Chapter 5). However, the use of such a circular Gaussian beam producing a circularly focused spot is not very desirable for flow cytometry. The beam shaping optics most frequently used in current flow cytometers utilize a pair of anomorphic prisms or two crossed cylindrical lenses that provide an elliptical spot of 1020 mm in dimension parallel to the direction of cell flow and 60 mm in dimension perpendicular to the flow dimensions. The advantage of the use of such an elliptical beam over circular beams of either 20-mm dimension or 60-mm dimension are illustrated by Figure 11.2. The elliptical beam provides a wider illumination field across the width of the flow so that the optical response (fluorescence or scattering) does not fluctuate if cells stray from the center of the beam. In other words, it provides a considerable side-to-side tolerance. At the same time, the smaller (20 mm) dimension of the elliptical beam parallel to the flow direction allows cells to pass in and out of the light illumination quickly and avoids simultaneous illumination of more than one cell at one time. This optical focusing also improves the power density distribution across the cell stream. In a multilaser system, each beam can be focused at the same spot using an elliptical lens system, which is achromatic and aspherical (see Chapter 7). Alternatively, each beam can be elliptically focused at different points along the stream, in which case a cell moves through each beam sequentially. The latter configuration provides for the resolution of dyes that have the same emission spectra but different excitation spectra. The alignment of the laser beam with respect to the stream of cells is crucial; a proper alignment ensures that the core of the stream is uniformly illuminated. The region of intersection between the stream and the laser beam is often called the analysis point, observation point, or interrogation point. A poor alignment between the laser beam and the stream may be due to misalignment of the illumination optics (focusing lenses) or from shifts in the fluid stream due to bubbles or partial obstruction. Collection Optics. The collection optics consists of a train of optical ports to separate and collect various optical responses produced by illumination of each flowing cell. These optical responses, discussed in more detail in the next subsection, are (i) forward scattering count (FSC), (ii) side scattering count (SSC), and (iii) various fluorescence signals at different wavelengths collected at 90° to the laser beam. The number of optical responses detected (hence the number of photodetectors used) define what is known as the number of measured parameters in a flow cytometer. Figure 11.3 shows a typical schematic of collection optics in a five-parameter cytometer: two scattering channels and three fluorescence channels (FL1 PMT, FL2 PMT, and FL3 PMT—in Figure 11.3) to monitor forward scattering, side scattering, and fluorescence signals in three different spectral regions. dichroic mirrors. A specific dichroic mirror, when oriented at 45° to the light signal, reflects fluorescence of a given wavelength while transmitting light of other wavelengths. As illustrated in Figure 11.3, the fluorescence signals of three different wavelengths (red, orange, and green) are separated by placing the dichroic mirrors in the path of the light collected at 90° to the illuminating beam. This arrangement also separates the side-scattered (SSC) signal. The beams after being reflected from a specific dichroic mirror pass through wide bandpass filters to further discriminate the desired fluorescence from other light. Then they are focused, through a pinhole for further spatial filtering to reduce stray light, onto the photodetector. In the case of light collection for the side scatter, the beam passes through a narrow bandpass filter (±5nm), centered at the laser wavelength, before going to the photodetector. Since the magnitude of the side-scattered signal is considerably greater than that of the fluorescence, often one may have to use a beam attenuator or even an optical glass plate (to reflect only 1% of the light) of light into the photodetector. The wide bandpass filters are helpful to discriminate two fluorescence signals that may overlap. The type of collection optics shown in Figure 11.3 are designed for particular fluorescence wavelengths being detected. In other words, the types of flu-orochromes which can be used for fluorescence tagging of the cells are fixed. Ideally, one may wish to use a different combination of fluorochromes, depending on the biological samples being analyzed. In such a case, a fixed set of dichroic mirrors is not appropriate and one has to use a dispersion element such as a prism or a grating. Figure 11.4. Block diagram showing necessary detection and electronics for flow cytometry. Detection and Electronics. The detection system and electronics used to acquire and process optical response are shown in Figure 11.4 as a block diagram. In most flow cytometers, the photodetectors used for flourescence detection are photomultiplier tubes. For the forward-scattered signal (FSC), which is significantly stronger than fluorescence, a much cheaper photodiode that has considerably reduced sensitivity can be used. An electrical preamplifier following the photodetector is required because a dc offset voltage that establishes zero baseline is used to account for steady-state stream fluorescence. This stream fluorescence is the result of fluorochromes remaining in solution. Subsequent amplifiers can be either logarithmic or linear. The logarithmic amplifier allows one to process signals over a wide range of intensities, while a linear amplifier restricts sensitive measurements to signals in a small linear range. The logarithmic amplifiers also have an "offset" control to select an intensity range to be analyzed without changing the amplification. For further details the readers are referred to a number of books (Shapiro, 1995; Givan, 2001). Logarithmic amplifiers are normally used for the analysis of fluorescence signals from cells stained with surface markers, because these cells often exhibit a great range of variation in fluorescence intensities. Linear amplifiers may be useful for analysis of forward- and side-scatter signals as well as for low-intensity fluorescence and for narrow-band fluorescence. A recent trend has been to replace the conventional photomultipliers with more compact solid-state photodetectors such as avalanche photodiodes (APD) (http://usa.hamamatsu.com/cmp-detectors/apds/default.htm) or new miniaturized photomultipliers (Shapiro, 1995). The APDs do not quite match the sensitivity of the PMTs in the visible range, but are the detector of choice in the infrared. They also provide the benefit of being small and all solid state. As mentioned above, another recent trend in the design of collection optics and detection is to use dispersion optics for polychromatic detection. In this schematic the orthogonal optical response, consisting of side scatter and fluorescence from various fluorochromes, used to stain cells, is dispersed using a prism or a grating. This dispersed signal can then be detected using a linear array of photodetectors such as that provided by a charge-coupled device often abbreviated as CCD. In this case, each element of the detector array detects a narrow spectral wavelength of light (Vesey et al., 1994). Another approach for polychromatic detection has utilized a Fourier transform or interferometric spectrometer (Buican, 1987, 1990). However, this type of detection is considerably more expensive. Optical fiber technology has also been used to deliver light to the detector. After being amplified by the amplifier, the electrical signal from the pho-todetector is then fed into an analog-to-digital converter (ADC). The ADC plays the role of converting a continuous distribution of electrical response into a group of discrete (digital) signals that can be conveniently displayed in various forms as discussed below in a separate section (Givan, 2001). The ADCs in a flow cytometer are divided into a number of discrete channels (usually 1024), each channel representing a certain specific light intensity range. Therefore, the signal from a specific cell can be recorded in a particular channel depending on the intensity (digital count level) of that signal. The intensity or count level of each channel can be set by adjusting the photo-detector (PMT) voltage and the amplifier gain. The full range of channels should encompass the full range of intensities relevant to a particular experiment. While the forward-scattered light (FSC) is often used to set the threshold level to trigger the ADC to accept data, any parameter can be used. The threshold defines the minimum brightness of any signal (digital count registered by ADC) used to trigger all ADCs for the parameters that are measured. The scatter threshold is helpful in avoiding problems derived from debris or electronic noise in the system. The signal from the ADC is then fed into a computer (PCs) and processed using various software packages to display data in appropriate forms as discussed in Section 11.4. Cell Sorter. Most commercial flow cytometers are not equipped with a cell sorter capability. However, for the sake of completeness the designs of cell sorting units used in flow cytometry are briefly discussed here. The two types of cell sorting devices used in flow cytometry are schematically represented in Figure 11.5. 1. Hydrodynamic focusing in a nozzle after passing through the interrogation point (illumination zone). Figure 11.5. Schematics of two types of cell sorting devices for flow cytometry. (a) electrostatic sorting, (b) mechanical sorting (Courtsey of C. Stewart and M. Casstevens). the cell stream into droplets ejected into air. This process ensures that the droplets will contain the specific cells. 3. Fluorescence response from a selective fluorescently labeled cell providing an electronic trigger that is time delayed to charge this cell as it reaches the charging collar. 4. Charged droplets containing selectively the specific cell population deflected by an electrostatic field from plates held at high voltage (3000 V). 5. Various collection devices such as tubes, plates, and so on, placed at appropriate location to collect a specific type of charge (positive, negative or neutral) and thus selected population of cells. In the electrostatic sorting method, as the cell intercepts the laser beam and a particular fluorescence characteristic of a specifically labeled cell is detected, the sort logic board of the cytometer electronics makes a decision based on the user-defined criteria whether this type of cell is to be sorted or not. The cytometer then waits until the cell has traveled the distance between the illumination point and the nozzle break-off point (called the drop delay) to charge the droplet with a specific charge (positive or negative). These charged droplets are sorted out on the basis of their charge by attraction toward the plate of opposite polarity. The electrostatic sorting method can be operated at rates up to 50,000 cells per second. The necessary time delay to trigger the vibrating nozzle and the charging collar can be determined from the flow rate of the cells. High-angle scatter: Reflection and refraction. Cell structure. Low-angle scatter: Diffraction. Cell size. Figure 11.6. The various optical response generated by interaction of laser light with the flowing cell. (Reproduced with permission from http://www.uwcm.ac.uk/study/ medicine/haematology/cytonetuk/introduction_to_fcm/optics.htm considered to be more gentle on cells, it has only a maximum rate of 300 sorted cells per second.